In a large bowl, combine the oats, oat flour, raisins, hemp seeds, baking powder, cinnamon, zest, salt and nutmeg, stirring to mix well. Add the applesauce, maple syrup, and chocolate chips. Stir until well incorporated. Use a cookie scoop (or take spoonfuls, about 1-1 1/2 tablespoons in size) to transfer mounds of the batter to the baking sheet. 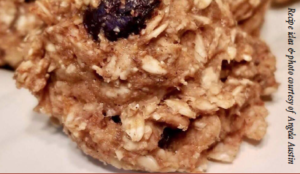 Sweetener Note: To make these snackles slightly sweeter, add either extra raisins, or 1 to 2 tablespoons of an unrefined sugar as Sucanat or coconut sugar. You can also add another 1 tablespoon of maple syrup (note that adding much more liquid sweetener will change the consistency of the batter).